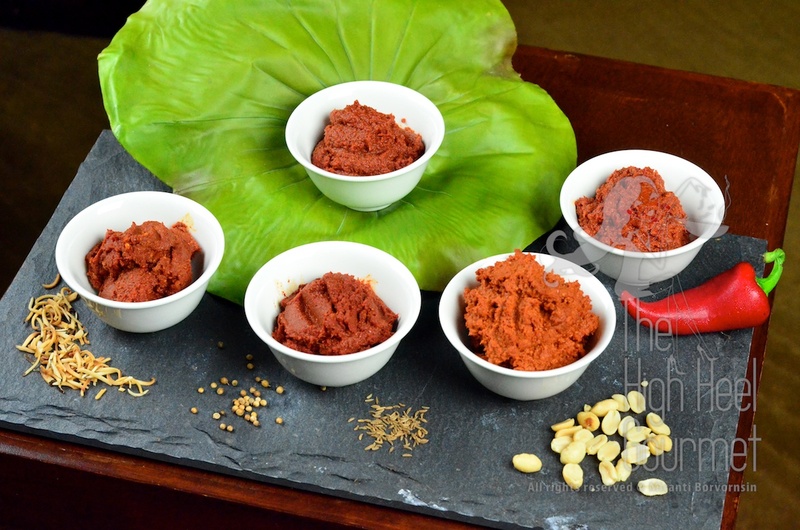 Also, I just want to tell you that, to Thai household right before the curry paste revolution (when people start using pre-made or store bought curry paste), curry paste is a signature of the house. If you know the Thai language and can look up recipes of curry pastes on the internet, you would discover that curry paste recipes are almost like bread recipes in their variation. The way I do this is obviously not traditional, but it works for me because I can’t always go pull lemongrass out the ground (even though I can do it right now) or dig up the galangal root to make fresh curry paste every time I make a curry. I can’t even go to the corner grocery store and ask to buy lemongrass the way I would do in Thailand either. My simple solution is to make the most basic curry paste, containing the least ingredients, which is Kaeng Kua, then I can add other ingredients to it to transform it into other curry pastes. 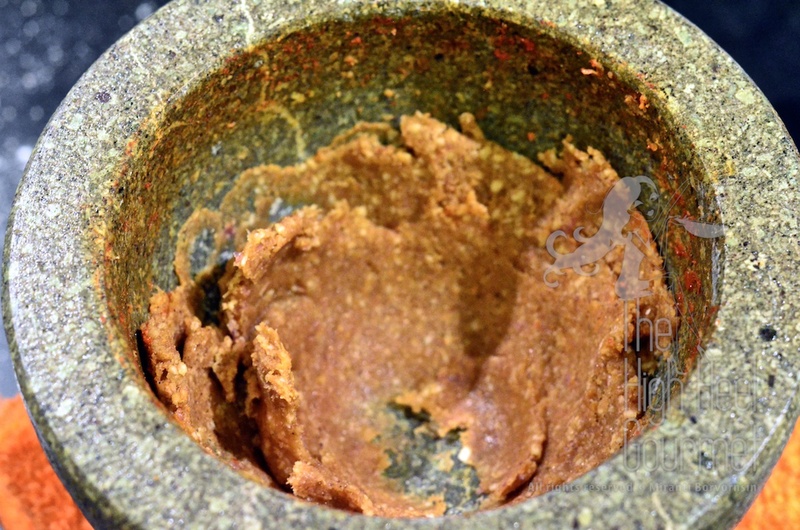 Kaeng Kua is the curry paste without “spices”. You might want to laugh; what about all the garlic, shallots, lemongrass, galangal, coriander root, Kaffir lime zest, etc…? Well, we do not consider them spices. 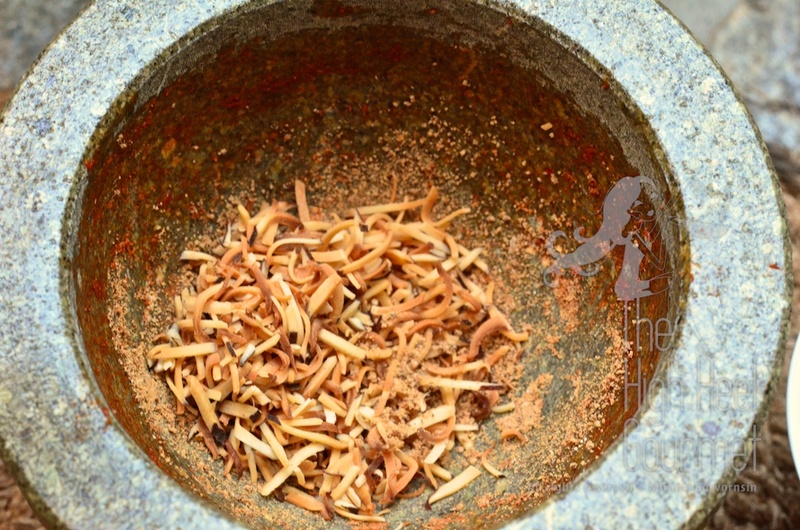 The ingredients that the Thais would consider as “spice” are cumin, coriander seed, nutmeg, mace, cinnamon, cloves, cardamom, bay leaves and star anise. Kaeng Kua has none of these spices. Kaeng Choo Chee also has none of these, but it has roasted coconut and white peppercorn mixed in with the Kaeng Kua base. Kaeng Phed and Kaeng Pa (Jungle curry) have coriander seeds and cumin and white peppercorn mixed in with the Kaeng Kua base, but Kaeng Pa has more fresh chili add on to the curry paste. 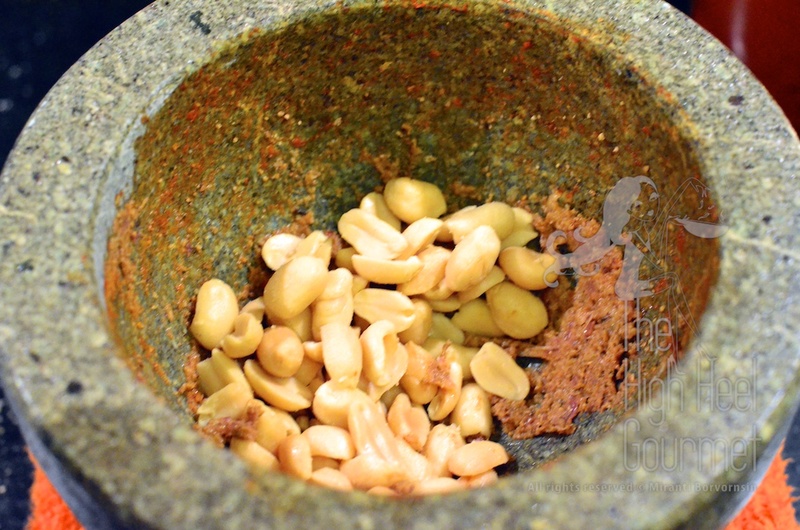 Kaeng Panang not only has coriander seeds, cumin and white peppercorn mixed in with the Kaeng Kua base but also has roasted peanuts . Do you see now why I make a big batch of Kaeng Kua? You probably still want to know exactly how to do it? 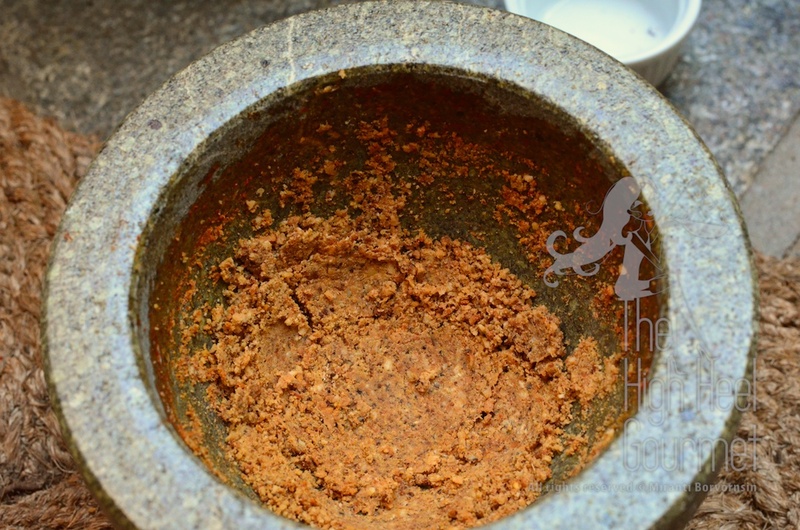 You just mush the extra ingredients in mortar first, and add Kaeng Kua curry paste into it. How simple, isn’t it? Oh…oh…not so fast. 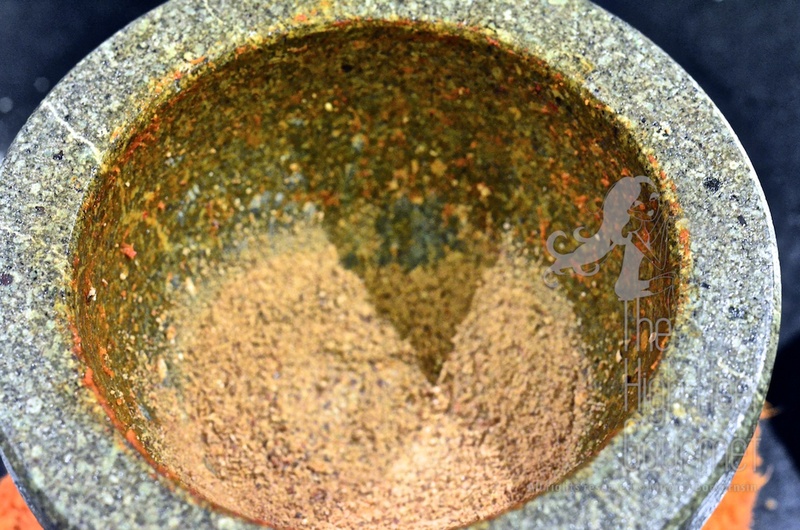 You have to roast all of the spices before you add them in the mortar. Couldn’t you just make the curry paste all at once from scratch? Sure you can. I do that sometimes too. 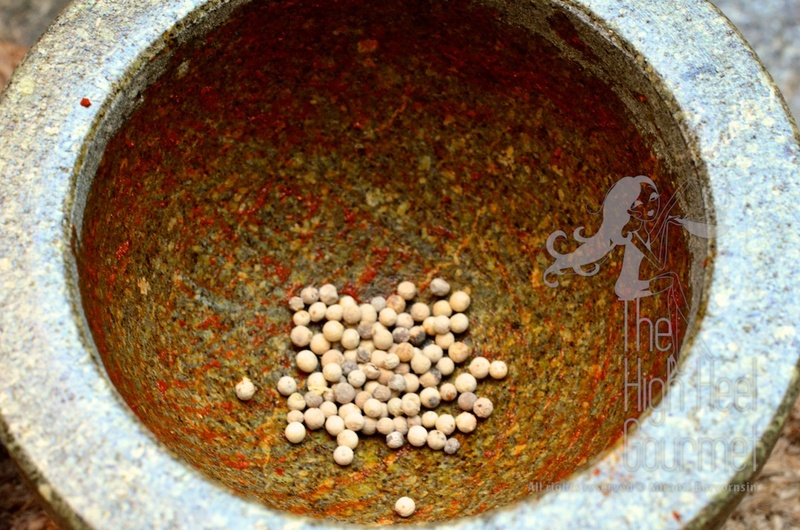 These days I don’t use a mortar and pestle to make my curry paste as much. It takes longer and I normally have to sit on the floor with my mortar because I can get more power to pound on the ingredients, but I have a very curious cat and dog. Can you picture them sitting around my mortar to watch me, with all their hairs and drools? I can’t use my Vitamix to make a small batch of curry paste either. 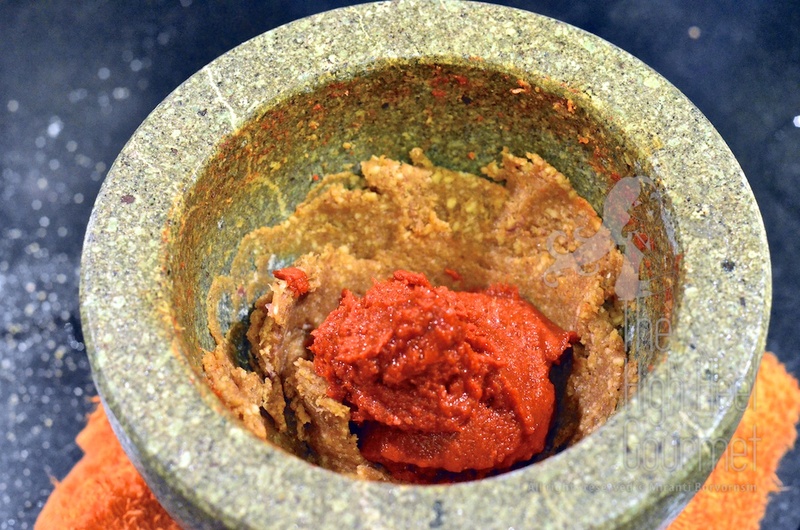 I only need about 1/4 cup of curry paste to make a pot of curry for two, but with Vitamix I would have to make at least a cup to cover the blades and ensure the flow. In that case I like to make a batch of Kaeng Kua curry paste and convert it to other curry pastes later. I also like to have Kaeng Kua curry paste in the fridge just in case I need curry paste in a heartbeat but don’t have time to run to the market to buy ingredients. Plus Kaeng Kua is the curry paste that is widely used in many recipes, but Chu Chee or Panaeng are quite specific. Let’s introduce you to Kaeng Panang and Kaeng Choo Chee. First, their similarity. Both are “gravy-like” rather than “soup-like” curries, meaning they don’t have a lot of liquid in the curry but have very thick gravy around the meat. They’re both appear to be in red color due to the red chili used in the curry paste. They both use coconut milk as a base. Second, their differences. In Kaeng Panang, there would be meat and poultry such as chicken, beef, pork, lamb, or duck. So it makes sense that Kaeng Panang contains spices, because Thai people do not like the smell of cooked land animal and try to cover it up with spice. They will cook Panang by boiling the curry with the meat and simmer it until the meat is tender and the curry is reduced to gravy thickness, then dress it with chiffonaded kaffir lime leaves. Kaeng Choo Chee, on the other hand, is usually found with fish, shrimp or other seafood. The seafood would be poached, wok-fried, steam or dipped in batter and deep-fried like tempura, before Choo Chee curry gravy would be poured over at the end. So, the Choo Chee curry would be cooked separately, seasoned until ready before pairing it with the already cooked seafood, just like a dressing or sauce. Also Kaeng Choo Chee will be finished with chiffonaded kaffir lime leaves as well. At a certain Thai restaurants both in Thailand and outside, you might see Panang and Choo Chee with Thai basil wilted in the gravy, but traditional Thai cooks will not put Thai basil (Ho-ra-pa) inside the curry, but instead serve fresh basil on the side or at the closest is put on top as decorative (still fresh and obviously not cooked with the curry) so you can chew on it to get the fresh taste. Please, do not ask me why Thai basil isn’t suppose to be put in the Choo Chee or Panang gravy. I don’t have the answer. I’ve been asking for at least three and a half decades! Have you ever though why don’t people cut baloney (balogna sausage) into about half-inch thickness and put it in a burger bun then call it a hotdog? Or why don’t they shape ground beef into a stick instead of a patty, grill it, put it in a hotdog bun then call it a burger? I guess the only answer is “Tradition”, putting all these types of questions in the same pile! Now you might be interested to know more about Kaeng Phed and Kaeng Pa. I use almost the same curry paste to make both curries, even though I might add more white peppercorn to the Kaeng Pa, but that doesn’t amount to much. My family’s recipe is slightly different than mine. They will add more fresh red chilies to the Kaeng Pa curry paste, together with the white peppercorn. (NOW you know why my recipe is different than my family.) They’re both using the same curry paste but they appear to be totally different because they use the different base. Kaeng Pa, or Jungle curry (Pa=jungle) is the water-based curry soup, or you might want to call it a soup base, but I never use soup stock to make it. It also has many more fresh herbs and vegetables too. Fingerroot, young peppercorn or green peppercorn are normally in the ingredients of the Kaeng Pa, and this curry isn’t finished with Thai basil like Kaeng Phed, but uses hot and spicy Holy basil instead, together with other pungent vegetables. 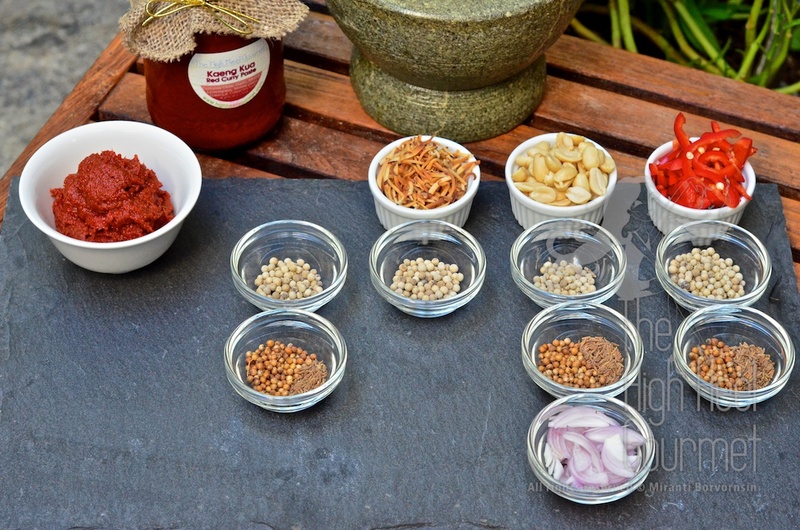 You will know more about the “options” when I dedicate a whole blog to the Kaeng Pa recipe. We’re merely scratching the surface with just the curry paste right now. Don’t worry, you will get plenty of examples and recipes in subsequent posts. Now that you understand that Kaeng Panaeng and Kaeng Choo Chee are gravy-like curries, and Kaeng Pa is the water base curry soup, then we can talk about Kaeng Kua and Kaeng Phed, which appear to be similar in color and both are coconut based. From the different names, you can safely guess that they’re not exactly the same, but how? 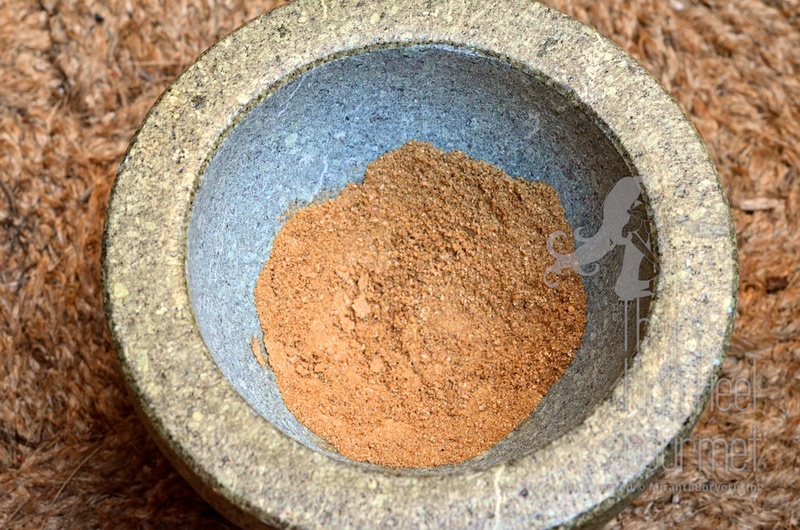 Kaeng Phed (Phed=spicy or hot) curry paste contains “spices”–cumin and coriander seeds—and in some other household recipes might contain even more than these two, such as clove, mace or nutmeg)—but Kaeng Kua doesn’t contain them. 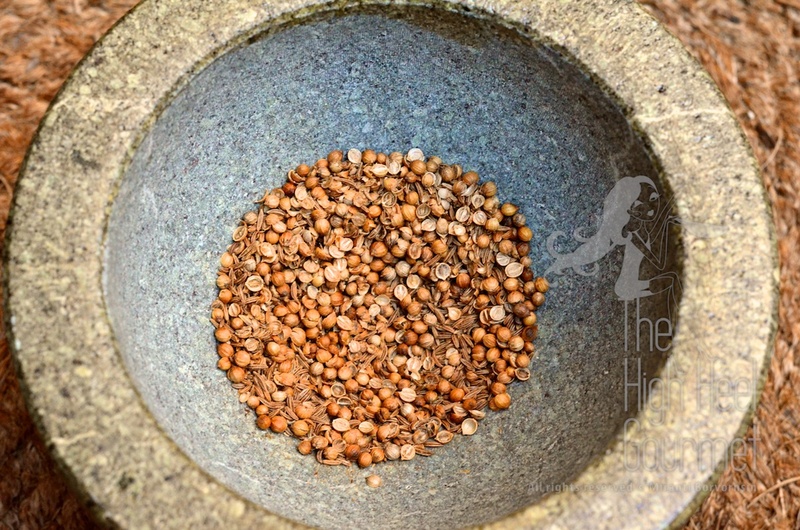 (Also, some households wouldn’t even put coriander root in their Kaeng Kua curry paste). That’s would be the first differentiation. Then there are more. Kaeng Kua normally would contain dried fish or dried shrimp in the curry paste, but that is still optional. Also, ingredients in Kaeng Phed dishes in general would have more meat than vegetables, but Kaeng Kua ingredients normally would be more vegetables than meat. Another difference is Kaeng Phed will be salty with a hint of coconut milk, sweet and never sour, but Kaeng Kua might be salty with sourness sometimes, depending on the vegetables added to the curry. The sourness usually comes from the vegetables, fruits or tamarind paste. Okay, since you understand the principle of each curry, let’s make a curry paste. The first one of course will be the Choo Chee curry. From LEFT: Kaeng Kua curry paste FRIST ROW: Ingredients for Kaeng Phed (from top: white peppercorn, coriander seeds and cumin seeds) SECOND ROW: Ingredients for Kaeng Choo Chee (from top: roasted coconut flake, white peppercorn) THIRD ROW Ingredients for Kaeng Panang (from top: roasted peanuts, white peppercorn, coriander seeds and cumin seeds, sliced shallots FOUTH ROW: Ingredients for Kaeng Pa (from top: fresh red chili, white peppercorn, coriander seeds and cumin seeds. and pound on them until they break down, but not as finely as the pepper. 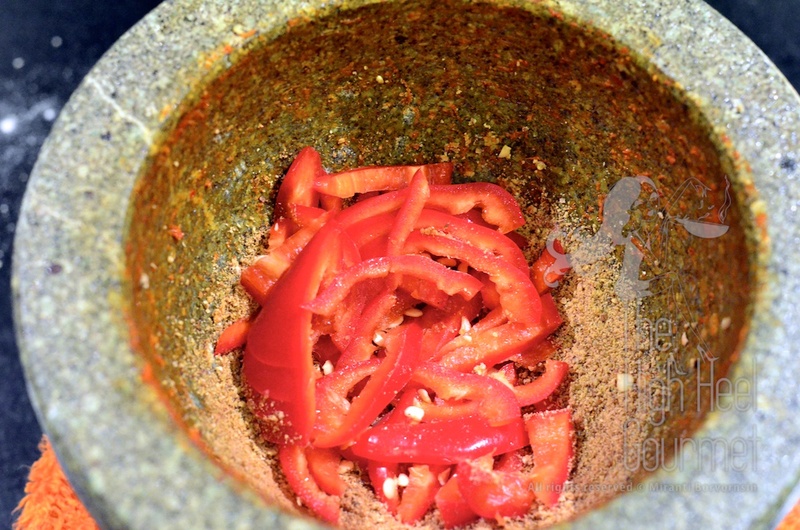 Add Kaeng Kua curry paste to the mortar and mix them. The Choo Chee curry paste is ready. Mush all the spices first until they are finely ground, including the pepper. and pound until they’re all mushed with no chunks left to be seen. and crack them until they’re ground, but we’re not making peanut butter here so don’t pound them too hard. Add the Kaeng Kua curry paste to the mortar and mix all of them well. This is your Panang curry paste. Same as the above; mush all the spices and pepper until they are finely ground and add the Kaeng Kua curry paste to the mortar and mix. That’s it! Fresh red pepper; I used 1 whole jalapeño red pepper (This is optional. If you like it very spicy then, add more or add the spicier pepper like Thai chili or bird’s- eye chili. I even de-seeded the baby jalapeño chili for my own curry! and mush them coarsely. The jungle curry doesn’t need the fine curry paste like most other curry. Then add the Kaeng Kua curry paste and just mix them. Now you have all four curry pastes as easy as that. 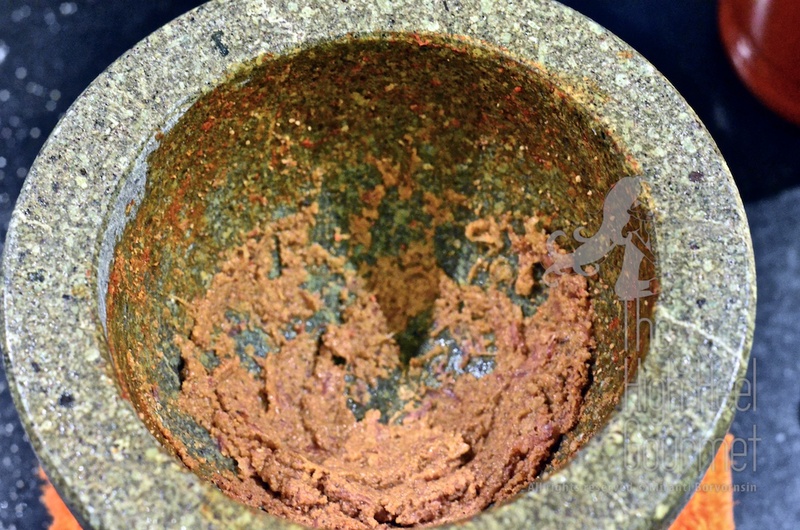 Please keep in mind that all the Thai curry paste ingredients are not carved in stone. You can start from here and you can adjust later on. Each family has a different approach. This is my own take on it. I like it this way. Some other family might add or subtract some minor ingredients, because their balance preference is different, but before you add ingredients that I didn’t list here, it would be best to go back to my first curry paste episode about what is not supposed to be in Thai curry paste, just to make sure. In the restaurants in Bangkok these days, I hardly ever found Panang with roasted peanuts or roasted mung beans, or Choo Chee with roasted coconut flakes in their curry pastes. I think the pre-made curry pastes and the Thai-style fast food restaurant, “Rhan Khao Kaeng”, that is all over the country, is responsible. Well, if you really want to point the finger, the lack of interest to create their own or even carry on the family recipe by the Baby Boomers and Gen Xs is the core of the cause. As I remember, my mother rarely spent time in the kitchen. She was working. My nanny is the one who cooked for the whole family. She was from Issan, the northeastern part of Thailand, so she knew almost nothing about cooking non-Issan dishes. My grandmother, together with my dad, taught her how to cook anything beyond making Som Tam, Larb and other Issan dishes. Since my grandmother taught her, she learned the traditional way of cooking curries and all the other Bangkok and Southern dishes. My mother would buy pre-made curry paste from the market (of course full potentcy heat from chilies, Thai style). But because I couldn’t eat spicy food but wanted to enjoy “adult” food, my nanny was forced to make curry paste the traditional way, minus the chilies, so her “Khun Noo” (little brat, me) can eat curry. Later on, when I expressed interest in cooking Thai food, mostly because I came to school overseas and I needed to learn survival skills, my nanny was a good source of information, along with my dad. This is not the same path that most of my Gen X friends took. Most of my friends, the Gen X, rarely paid attention to Thai cooking. Why? Because restaurants and street vendors are all over Bangkok. They didn’t growing up eating home-cooked meals anyway, because their parents, the baby boomers, were so busy working. If they ever tasted a home-cooked meal, it would have been from their grandma or the hired cooks, the helpers at home that made the meals. The majority of them know and had eaten curry all their lives, but if you ask them to make curry paste from scratch, they probably can’t do it. They rely heavily on the pre-made curry pastes. 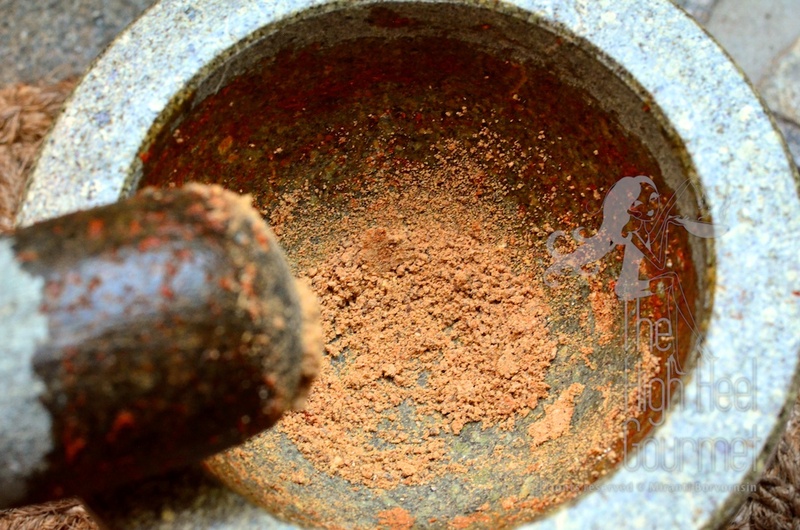 With regard to the pre-made curry paste, certain ingredients like roasted coconut or roasted peanuts shorten the shelf life of the pastes, so the merchants wouldn’t want to put them in their curry paste. When I was young and the pre-made curry pastes were just a new thing in Thailand, the merchant didn’t even put shrimp paste in the pre-made! This was before they learned to sterilize the paste. The protein in the shrimp paste could have spoiled the curry paste and reduced the shelf life considerably. 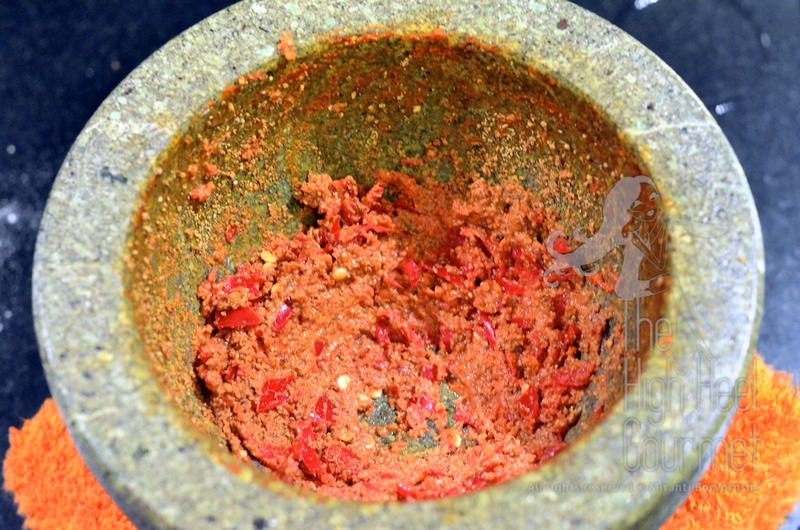 Back in the day, the housewife who was advanced enough to use pre-made curry paste knew to mush shrimp paste into the paste before cooking with it. These days, when the pre-made curry paste already include shrimp paste, they’re quite complete. Some of them are ready to be used right away, such as the most popular Kaeng Phed (Red curry), Kaeng Khiao Wan (Green curry), and Kaeng Masaman, which is the most complicated curry. So the cooks in the “Khao Kaeng” restaurant probably don’t know to “re-work” the paste by putting roasted coconut in Choo Chee curry paste or putting roasted peanuts in Panang curry paste. That’s my assumption. Another assumption is the roasted coconut or roasted peanuts are “optional ingredients” for some households. The Choo Chee curry paste at my house, normally didn’t have galangal and cilantro root in the curry paste, but at my uncle’s house his wife put galangal, cilantro and fingerroot but didn’t put roasted coconut in it. The Panang curry paste recipe I gave you is my own invention. My grandmother would cut the amount of garlic in the curry paste if she made Panaeng. She would not only put roasted mung beans in the curry paste (because it was something readily available in her kitchen at all times, unlike peanuts that she had to specifically buy), but she also put turmeric in it, too. Are you confused enough now? Each household has their own balance, but the ingredients wouldn’t differ from the handful of the ingredients I already gave you, even though the amount of each ingredient might vary. 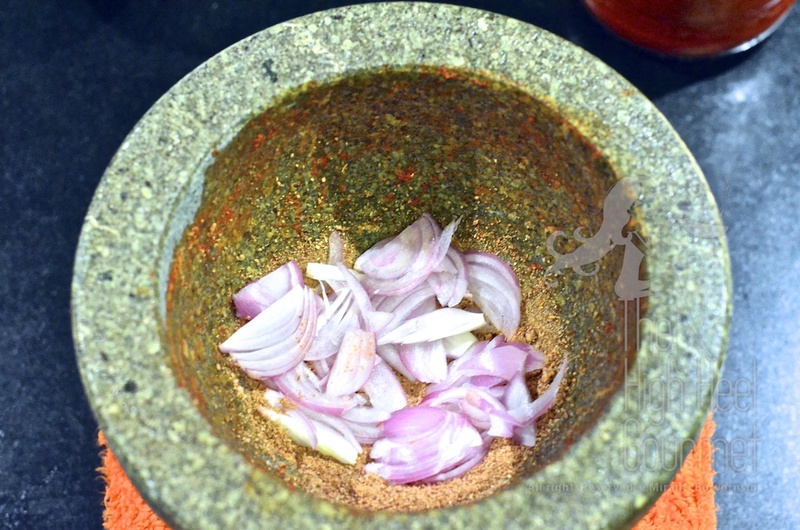 Eventually, you will develop your own or relax about “HOW MUCH” you should put of each ingredient into your curry paste. As long as you stop clicking on the “ABOUT something I don’t know well but want to share.com” site, then you will be fine. Please, remember that “Ketchup” is NOT an ingredient in Thai curry paste, no matter how many non-Thai who pretend to know Thai food or have written a cookbook or two about foods that look like Thai foods (but they’re actually not) try to tell you. You won’t get Thai people to appreciate your curry if you add even a dash of it in. I mean only the polite Thai people will just “not appreciate” your added ketchup, but li’l ol’ me…hell yeah…I would barf it out right in front of you! Next week I will show you how to apply the Choo Chee curry paste to a seafood dish. This entry was posted in Clicking in the Kitchen, Comfort Food, Curry, Thai, Thai Curry Paste and tagged Asian, Coconut milk, Cooking, Curry, Food, Galangal, gluten free, Recipe, Seafood, Soup, Thai Curry Paste, Thai food, Thai Red Curry Paste. Bookmark the permalink. I am going to try the Panang curry soon and wanted to know when I add the peanuts to the paste and pound, then the paste will not be the smoothest right? I mean the ground peanuts will give it some texture (since we are not to pound on it too hard?). No, the paste should be smooth unless you like the corse paste for texture. I’m speechless! I’m a Thai cuisine devotee of more than 25 yrs, but only if it’s authentic, and you are clearly all about that 😉 Your site is simply incredible, pics are gorgeous and your attention to detail is amazing! How do you feel about freezing kafir lime leaves, do they lose too much flavor, could they be dried? Thank you for creating this incredible resource! Kaffir lime leave can be frozen quite well. No problem. You can freeze the kaffir line peel too, just peel them first before freezing but do not freeze the curry paste. If you put enough salt it would stay in the fridge over a month. 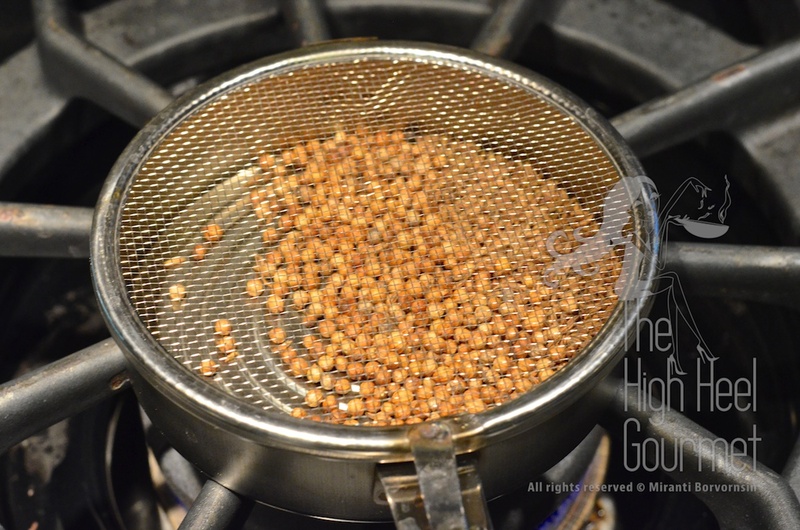 This is the MOTHER of all websites related to serious thai cooking. my family loves thai food and this website has allowed me to cook great food for them. I greatly appreciate the time you have spent explaining everything in such detail, I learned a lot from you. thank you. I’m glad that my site can helps people cooking their own Thai foods at home. Your comment really made me happy and encourage me to continue doing the blog. Your posts are so informational and easy to understand — the pictures you post with the instructions are super helpful — you make it look so easy! You do make it easy. Great documentation! You are a wonderful teacher ka! Kaeng pa is going to be on my dinner menu this week now for sure 🙂 thank u! How was your Kaeng Pa ka? I just made one myself with rhubarb and salted beef jerky ka. Miranti, I really love your food and blog. This is another wonderful tutorial. I’m always learning something every time I visit. Once again, very nicely done. I like this post. A lot. I will be spending a lot of time here. I have often made a large batch of curry paste and put the extra in a small glass mason jar, topped it off with a neutral flavored oil, just enough to cover, and put it in refrigerator until I need it next. The oil prevents air from penetrating the paste which prevents bacteria from growing. 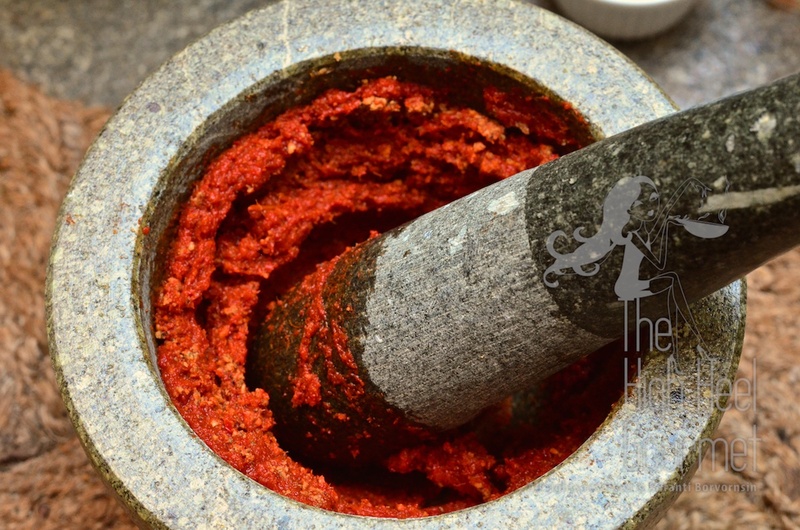 The method is widely used to preserve other Thai ingredients such as Nam Phrik Pao or Thai chili jam but obviously NOT for the fresh Thai curry paste or else you would see authentic Thai curry paste preserved that way. In fact you would see most of them (one that export from Thailand or made by the Thais) sterilized by steaming and packed in package for sell just like that. The reason is the usage. Not all Thai curry pastes would be used by frying with oil. If you read my previous posts, the Thai fried fish cake, Tod Mun, the Thai fish mouse, Hor Mok did not use the “cooked” curry paste. If the curry paste touch oil and the oil goes in the fish cake, the fish cake would fall apart at the worst and soggy at the best (believe it or not because the cake will be fried in oil!) and the fish mouse would have the same symptom. There are many more Thai curry pastes that are cooked without frying in oil. In fact we don’t even fry them in oil originally, we fry them in coconut milk that has some oil (coconut oil) on top. That curry rely so heavily on the freshness of the ingredients in the curry paste so Thai people wouldn’t sacrifice that freshness for shelf life. Excellent post, the best written about thai curry ! Thanks! I wish I can write or speak Spanish too. There are a lot of Latino in Los Angeles who LOVE Thai food and want to learn how to cook them but I can’t teach them in Spanish. My house keeper who don’t speak a lot of English begging to learn how to make Kaeng Phed and Tom Yum. So, I taught her to cook with very little words and I sent her daughter a link to your blog. Thanks that I’ve found your blog naka even though I don’t understand the words but the pictures are beautiful and at least I have a place where I can send Spanish speaking people to learn Thai cooking. Thank you so much ka, i’m so glad and happy about it. Even though here in Spain is a little bit dificult to find many Thai ingredients, I am trying to do my best in order the spanish and also latino people learn and taste Thai food. Greeting from spain ka. The best written, most charming, most informative article on curry I’ve ever read. Your images are always so beautiful, and you have a knack for making the difficult look simple. Thanks. If you can find the ingredients to make them, I recommend it. But once you do, you can’t go back and eat the pre-made curry though. This is so useful! I have bookmarked this post! 🙂 You will come back to this a lot. Really elegant post. 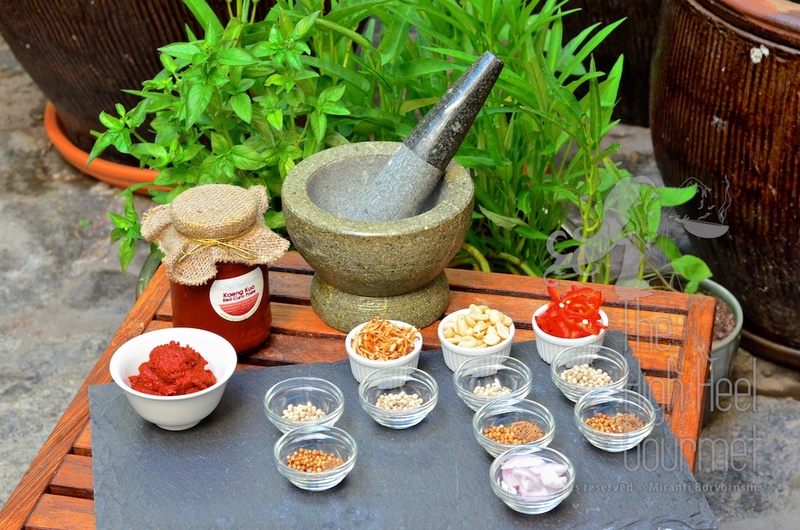 The flavours from an authentic paste are totally different to anything one can buy in a jar. Keep up te great work. That’s so true! I can use the pre-made one in the jar but I don’t get the curry the same way I use to eat at home.